Join us for an interactive program that will address biases and myths that surround relationship violence and sexual assault in the Black community. This scenario-based educational opportunity will directly confront misconceptions that are embedded within our communities about what violence looks like and who is affected. 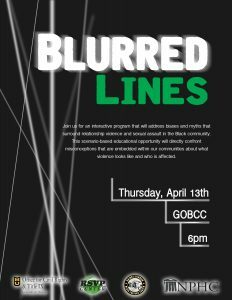 Blurred Lines will be held on April 13th at 6pm in the Gaines Oldham Black Culture Center. This event is in collaboration with the Office for Civil Rights & Title IX, the RSVP Center, and the National Panhellenic Council.